The BEST meatball placed between bread. I topped it with Mariana sauce, cheese, and then baked. 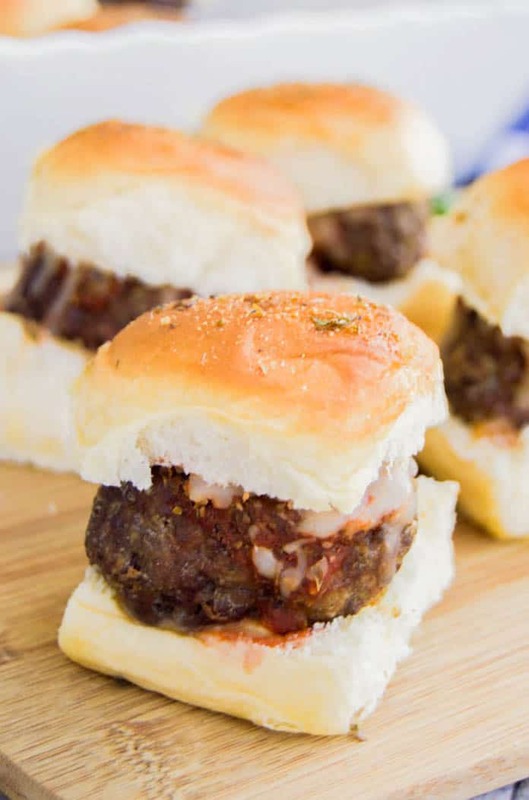 These Meatball Italian Sliders are perfect for a quick dinner or fun appetizer. Have you ever gone to a restaurant and just ordered and appetizer as your dinner. I am so guilty of this. I mean who doesn’t want cheese fries, mozzarella sticks, or sliders as dinner. 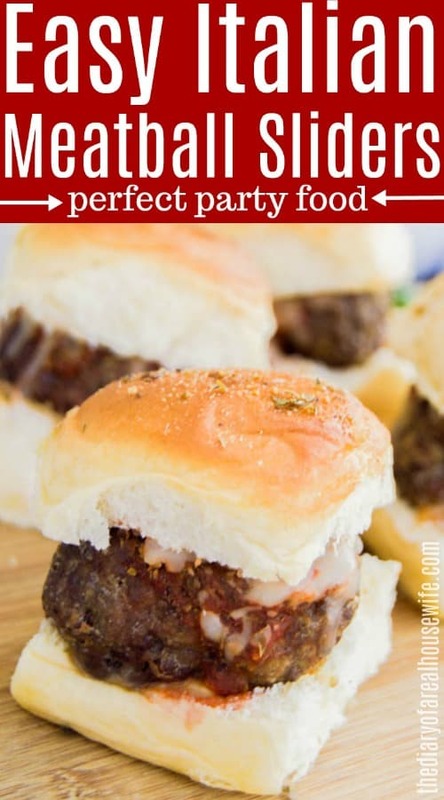 These Meatball Italian Sliders are appetizer for dinner recipe. 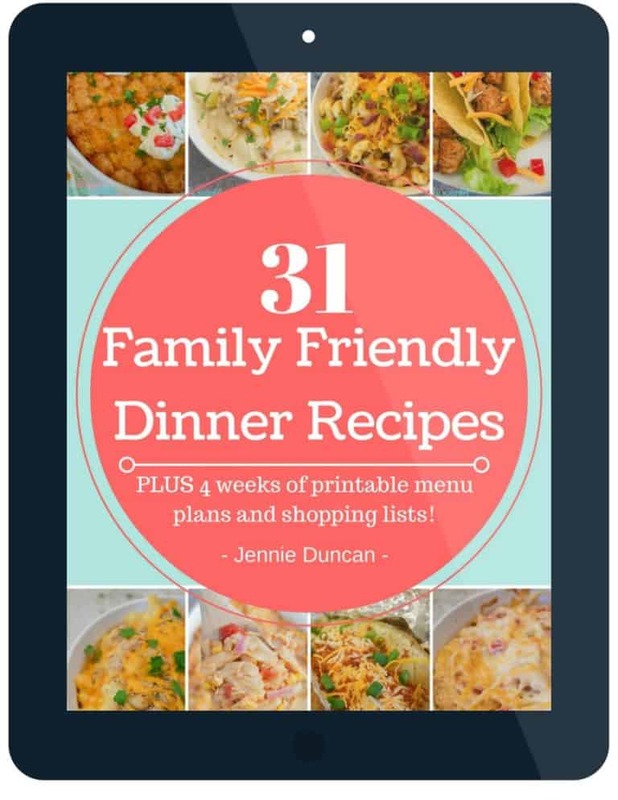 While I have served them for game day or at a party I usually serve them as dinner and the entire family loves them. When I made these last week husband came home from work late so we already ate dinner so he asked what I had made. I told him sliders and he better eat them fast otherwise I was going in for seconds! When you are ready to cook you want to start with the meatball. 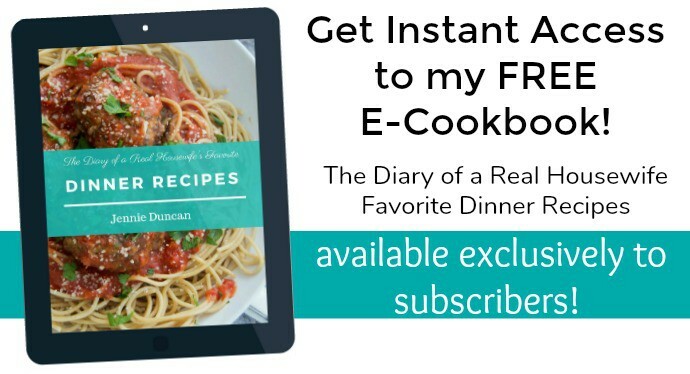 So go ahead and preheat your oven to 400 degrees F. Prepare a baking sheet with nonstick cooking spray and set aside, this is what you will bake your meatballs on once they are ready. Place beef with onion powder, garlic powder bread crumbs, egg, parmesan cheese, salt, Italian seasoning, and 2 tablespoons of marinara into a large mixing bowl. Mix until combined. Form balls and place it on a prepared baking sheet. Depending on the size you should come out with 12 meatballs. If you don’t then take a little from each so you can get 12 and have enough for each roll. Bake for 15-20 minutes or until meatballs are cooked through. 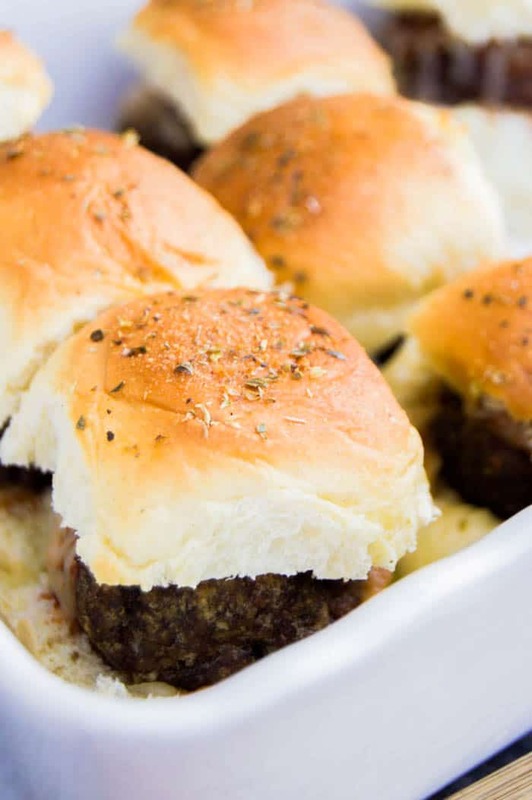 Place each meatball on a slider and into a casserole dish. Top with a spoonful of marinara sauce and a sprinkle of mozzarella cheese. Bush the tops with olive oil then sprinkle with dried oregano and additional garlic powder. Bake for an additional 5 minutes until cheese is melted and bread has started to brown. Serve warm and enjoy. You don’t have to top these on sliders you could toss them on spaghetti also. 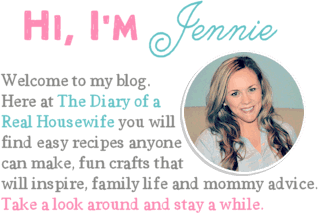 This is actually one of my favorite meatball recipes and the one I typically make. When you are making them for sliders you want to make sure you are rolling and baking 12 meatballs. Unless that is you have 6 rolls then make 6 really awesome meatballs and bake them a little longer. It’s all up to you chef! I served these with a salad and my roasted ranch green beans and made it dinner but the recipe works perfectly as an appetizer also. Since you love sliders so much, try these out also!! 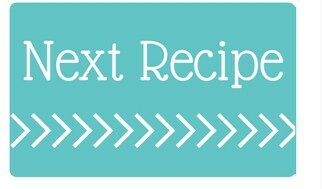 Preheat oven to 400 degrees F. Prepare a baking sheet with non stick cooking spray and set aside. Place beef with onion powder, garlic powder bread crumbs, egg, parmesan cheese, salt, Italian seasoning, and 2 tablespoons of marinara into a large mixing bowl. Mix until combined. Form balls and place it on prepared baking sheet. Depending on the size you should come out with 12 meatballs. One for each slider. Bake for 15-20 minutes or until meatballs are cooked through. Place each meatball on a slider and into a casserole dish. Top with a spoonful of marinara sauce and a sprinkle of mozzarella cheese. Bush the tops with olive oil then sprinkle with dried oregano and additional garlic powder. Bake for an additional 5 minutes until cheese is melted and bread has started to brown. Serve warm and enjoy.